Wondering how to write an invitation to become a board member? Below you'll find a sample advisory board invitation letter you can use to recruit people to serve on your small business's board. An advisory board staffed with qualified individuals can provide your business with advice and expertise in a variety of disciplines including management, marketing, accounting, staffing, customer service, technology, etc. Harness the Power of an Advisory Board explains what having such a management group can do for your small business in more detail. 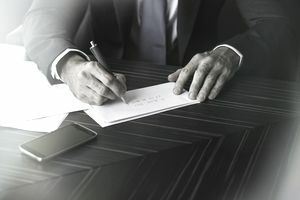 To persuade people to serve on your board you need to craft an invitation letter that describes the benefits of becoming an advisory board member for your business. In other words, just as in any other kind of marketing, you are making a pitch and you have to make joining your board as attractive as possible to your potential recruit. The following is a sample of how an invitation to become a board member letter should be structured with directions for writing the content - feel free to customize it as required and use it to invite people to serve on your own small business advisory board. I'm pleased to invite you to become a member of the Consider It Done Business Advisory Board for 20__ - __. As one of the pioneers of the Virtual Assistant (VA) Industry, being a member of Consider It Done's Advisory Board provides you with a stellar opportunity to continue to shape the VA industry. My company, Consider It Done Ltd., needs a new direction. A person with your experience and insight would be the perfect person to help me determine whether my company should break new ground or whether there's still value to be gleaned from the traditional territory. I will certainly cover any expenses you incur from attending advisory board meetings and also offer a $500 honorarium to be paid directly to you or to a charity of your choice. Operating since 2005, Consider It Done Ltd. provides a spectrum of business services to clients, ranging from data-processing through graphics design. First started as a one-woman operation run from a basement, Consider It Done Ltd. now has three full-time employees and a host of part-time contract workers. We continue to focus on filling our clients' needs completely and fully; our company motto is "We'll do it right". The main purpose of the Consider It Done Ltd.'s Business Advisory Board is to provide management advice about the direction the company should follow. Specific goals for this year include developing a niche market strategy and revamping/updating the company's online presence by creating and implementing a social media plan. The Board will meet three times this year, each meeting consisting of a dinner following a ​two-hour discussion. There may also be some follow-up questions/discussions by email. Because of the nature of the matters to be discussed, members will need to sign a confidentiality agreement. Thank you for taking the time to read this letter and to consider being a part of Consider It Done Ltd.'s Advisory Board. I will be in touch with you soon but in the meantime, I’m available to discuss any questions you may have. You can reach me by phone at (phone number) or via email at (email address). Do remember to follow up on this advisory board letter as you said you would! Allow at least a week to pass before you call or text the prospective board member as people (especially the kind of people you want on your board) are so busy. Call instead of emailing if possible to begin with as email is much easier to ignore than a phone call. And continue to follow up as necessary. It may take more than one call or email to reach your prospective recruit, or the person may ask you to call back in a certain period of time after they've had a chance to think it over. Once you've recruited members for your advisory board the next step is to have your first board meeting. For more information on how to plan your initial meeting with your new advisory board members see: Sample First Meeting Agenda for an Advisory Board.